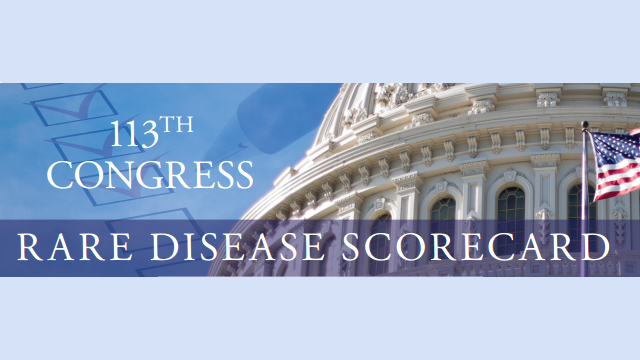 Rare Disease Legislative Advocates compiled a congressional scorecard to educate advocates on how their Representative has voted on issues affecting the rare disease community. Each Representative’s score is based on membership in the Rare Disease Congressional Caucus as well as action taken on legislation important to the rare disease community. The most powerful tool a legislator has is their vote, but a sampling of votes and actions on bills does not always provide the full story. The rare disease community followed many bills that are not on this list and legislators may have taken action in other ways not captured by this scorecard. Some bills progressed to laws, while others may have been halted during the legislative process or had provisions incorporated into other bills. In addition, legislators may have worked in committee or in other ways to secure an amendment or enable a compromise. Thus, a voting record provides crucial, fact-based insights into legislative activities, but is not intended to be a comprehensive indicator of rare disease impact. Members we given a √ for being an author, original co-sponsor, co-sponsor, co-chair, signer, and a yes vote. Accelerated Approval Sign-on Letter: Representatives received a point for signing-on to the bipartisan letter calling on FDA to help ensure that recently passed legislation (FDASIA) provides rare diseases access to accelerated approval. H.R. 2019 – Gabriella Miller’s Kids 1st Research Act: This bill redirected funding from political conventions to the National Institutes of Health (NIH) Common Fund to support transformative research for childhood cancer, autism, fragile X syndrome and other rare pediatric diseases. This bill was voted on (12/11/13), became law, and was appropriated on 12/16/14. Members received four points for introducing the bill, three points for being an original co-sponsor and voting ‘yes’, two points for being a co-sponsor and voting ‘yes’, and one point for voting ‘yes’. H.R. 225 – National Pediatric Research Act: Enables the establishment of a National Pediatric Research Network managed by the NIH. This bill was voted on and members received four points for introducing a bill that passed, three points for being an original co-sponsor and voting ‘yes’, two points for being a co-sponsor and voting ‘yes’, and one point for voting ‘yes’. H.R. 1281 – Newborn Screening Saves Lives Re-authorization Act: Promotes expanded screening of newborns and children for heritable disorders. This bill passed the house by voice vote, so no record of individual votes was made. Members received two points for being one of the original co-sponsors on the bill and one point for co-sponsoring the bill at a later point in time. This Bill is currently awaiting presidential signature. H.R. 3116 – Modernizing Our Drug & Diagnostics Evaluation and Regulatory Network (MODDERN) Cures Act of 2013: The language to improve access to diagnostics and spur diagnostic innovation was included in Medicare Sustainable Growth (SGR) reform, passed by Congress earlier this year. The dormant patent provision is designed to encourage the development of drugs to treat conditions with few or no treatment options and has gained significant support, leading to a companion bill in the Senate and potential for the provision ti be included in the broader 21st Century Cures legislation. H.R. 460 – Patients’ Access to Treatments Act of 2013: Prohibits health insurance plans from imposing cost-sharing requirements, including co-payment and co-insurance, applicable to prescription drugs in a specialty drug tier. This bill did not pass this Congress but gained significant support from patient groups, industry and legislators. H.R.2725 – FDASOS: Amends the Balanced Budget and Emergency Deficit Control Act to exempt the user fees paid by industry from sequestration (mandatory across-the-board spending cuts). Support of this legislation enable Congress to ensure the FDA received the full revenues from User Fee in the current budget. The legislation needs to pass to ensure the FDA received the full revenues from User Fee in the current budget. The legislation needs to pass to ensure the exemption becomes permanent.